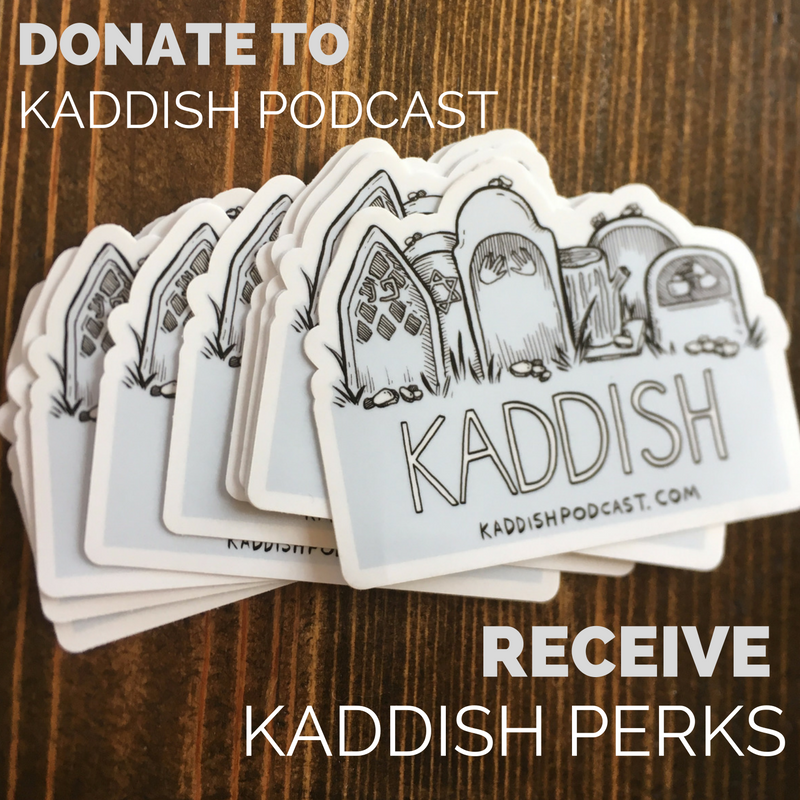 Kaddish is a monthly podcast hosted by Student Rabbi Ariana Katz that focuses on mourning ritual and customs, features first person storytelling and interviews, uses Jewish tradition to contextualize and deepens themes of the show, and holds space at the intersection of life and death. Kaddish aims to build a network of listeners and friends that will contribute stories and build online community. This show includes topics like mourning chosen family, reproductive loss, illness, ritual writing, suicide, queer and trans burial, tattoos and conversion status, state violence. Also guests talks about their specific interests and storytelling from folks about loss or grief and healing. There is a dearth of death education, and there is a romanticising, exoticizing, and sexualizing of death. Kaddish aims to stay in the muck, the complicated, unsexy, terrifying places, because those too are a part of grief. Please use the form if you'd like to get in touch! Ariana Katz is the host and creator of Kaddish the podcast. Ariana is a rabbinical student at Reconstructionist Rabbinical College in Philadelphia. She is a member of the Philadelphia Reconstructionist Chevra Kadisha (Jewish burial society) and a volunteer chaplain and board member at Planned Parenthood of South East Pennsylvania. Ariana is in training to become a soferet, scribe of sacred Jewish text. Kaddish's farewell episode, recorded live at Kol Tzedek at the Calvary Center for Culture and Community on July 6 in Philadelphia, PA. Following this recording, Kaddish will be on a hiatus. Our website, kaddishpodcast.com, will remain live and episodes can be revisited on iTunes + Soundcloud. In this episode of Kaddish, listeners share their stories of chosen family and grieving the losses of loved ones. Where is there room in the Jewish tradition to honor the role that chosen family, logical family, plays in our lives? How have others mourned the losses of chosen family? Featuring the voices of Rabbi Vivie Mayer, as well as Rebecca, Noga, Meryl, and Sarah. Graham Garner of the Friends Southwestern Burial Ground and Namrata Kolla of Coeio join episode 6 of Kaddish to share stories of synchronicity and celebrating identity in burial. Naomi Leapheart and Christa Craven discuss queer reproductive loss in episode 5. They weave the body and spirit into our imaginings of what reproductive loss is- something that happens to queer bodies, and in queer families. If you want to share your story of reproductive loss with the Kaddish community, you can call 240-KAD-DISH and for a listener episode. What is it about the taharah ritual that can transition a person from this world tothe next? And why does it necessitate gallons of water? Rabbi Linda Holtzman,founder of the Reconstructionist Chevra Kadisha of Philadelphia joins Kaddish to talk about the origins of the local progressive community that washes and prepares the dead for burial. David Zinner, Executive Director of Kavod v'Nichum and the Gamliel Institute shares historical and contemporary context of the ritual. A conversation with Deidre Scherer, textile artist that often focuses on the faces of the elderly, they dying, and the deceased. Content warning: storytelling includes audio of air raid sirens. Listen to this bonus episode here. For guest articles, profiles of the show, presentations, or perspective on issues of death, mourning, and identity, contact Ariana at ariana@kaddishpodcast.com. This project was funded through the Reconstructionist Rabbinical College with a grant from the Jewish Federation of Greater Hartford and generous listener support. Thank you to all who have donated time or money to see Kaddish flourish this season! Please complete the form below with questions or comments, and Ariana will receive your message. Please note that the show is now in hiatus, so email is checked very occasionally.